What would we do for crowd-pleasing desserts if we didn't have 13x9-inch pans? You can't make these rich and creamy no-bake Creamy Mocha Squares without one. Line 13x9-inch pan with parchment paper, with ends of paper extending over sides of pan. Arrange wafers on bottom of prepared pan. Add coffee granules to milk; stir until dissolved. Add to dry pudding mix in medium bowl. Beat with wire whisk 2 min. or until well blended. Stir in yogurt; spoon over wafers. Top with whipped topping ; cover. Refrigerate at least 3 hours. Use parchment handles to remove dessert from pan before cutting to serve. Sprinkle with cocoa powder. Store leftovers in refrigerator. 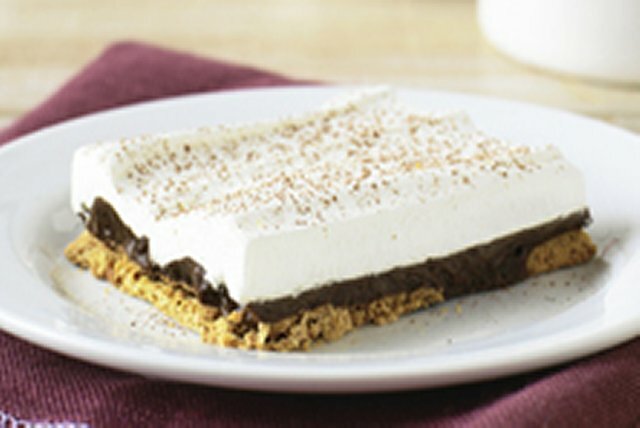 When cutting a creamy-textured dessert into squares, carefully wipe off knife blade between cuts with a clean damp towel. This prevents the creamy filling from building up on the blade, ensuring clean cuts that leave the edges intact.